Gaming Club Casino is definitely an underrated casino relative to its level of excellence. It has been a member of the Belle Rock Entertainment group of online casinos for quite some time now and while it does not get as much attention as counterpart online casino River Belle, you can certainly make an argument that this online casino is just as good. The Gaming Club software package is the one that was created and continues to be licensed out by the Microgaming Corporation. It is an excellent software package for that reason, but it is also worth realizing that any software package is only as good as player feedback. According to the people that have played this software package before, it is great in terms of graphics, does not distract from the actual game play and allows you to easily run multiple other programs at the same time. That’s about all anyone could want in an online poker software package. 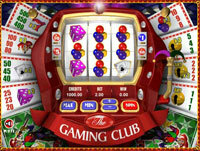 Gaming Club Casino has one of the best splits between games available online and games available in download. If you download the casino, you’ll get more than 350 games. If you play it online, you’ll still get 150 of the best games that Gaming Club Casino has to offer. Between table games, blackjack games, video poker games and slot machines, you’ll find plenty of choice in both the online casino and the downloadable casino as far as gaming selection is concerned. Gaming Club Casino has two opening offers for new players. The first involves the ability to take 30 free spins in the casino and keep the profit that you make from them. The second is a standard welcome bonus that is worth 100% up to $100 on the first deposit that you make. A loyalty program follows where you can get cash back based on the wagers that you make at the online casino. No USA players are allowed at Gaming Club Casino as it is affiliated with the non-US Microgaming Corporation. Gaming Club Casino offers help through FAQ documentation, e-mail forms and live chat, all of which can be accessed directly from the help page on their website. They also have toll-free numbers available for Australia, United Kingdom, New Zealand, Switzerland, France, Spain, Germany, Canada, Japan, Austria and Italy. All other countries can still get telephone support long distance by calling +44-800-917-8547. 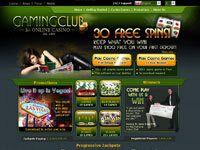 Gaming Club Casino has been around for a long time and it has only been getting better with time. Its present day form is definitely underrated and certainly worth your time and money.